Le’Andrea Vernon, a single mother working full time, struggles to find preschool enrichment programs for her 3-year-old daughter that accommodates her work schedule. Brenda Carman, who makes ends meet with support from her son’s father, finds the preschool programs that will help her 3-year-old get ahead can be too expensive. 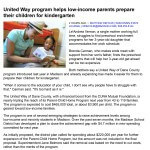 Both mothers say a United Way of Dane County program introduced last year in Madison and already expanding has made it easier for them to prepare their children for kindergarten.